^ Černe, Andrej (2004年). Orožen Adamič, Milan. ed. Gateway to Western, Central, and Southeastern Europe. Slovenia: A Geographical Overview. Association of the Geographical Societies of Slovenia. p. 127. ISBN 961-6500-49-X. http://zgs.zrc-sazu.si/Portals/8/Slo_Geo_Over/23.pdf. ^ a b Perko, Drago (2008年). 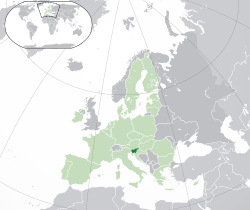 Slovenia at the Junction of Major European Geographical Units. Toronto: Vse Slovenski Kulturni Odbor [The All Slovenian Cultural Committee]. http://www.theslovenian.com/articles/2008/perko.pdf.